Samsung has just wrapped up their #7unpacked2016 event where Samsung Galaxy Note 7 was launched officially. There were numerous leaks about specs, price, launch dates since the last 4 months but now its official. Samsung Galaxy Note 7 has Corning Gorilla Glass 5 front and back panels. Samsung Galaxy Note 7 comes with Dual- Curved Screen and rounded back side with symmetrical design. The UI is more refined. It will come in 4 colors. 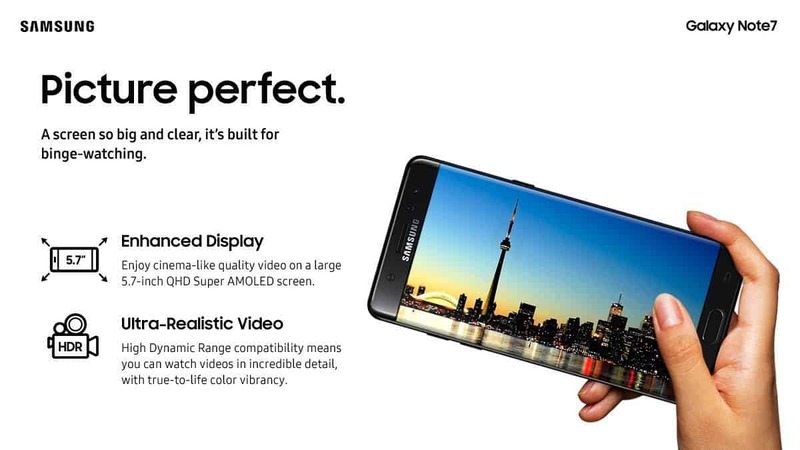 It comes with an enhanced S-Pen having 0.7 mm thin tip with dust resistance. New Samsung Notes apps introduced which will store all notes taken down by S-Pen. The software of S-Pen has also been enhanced. It can act as a translator, taking quick note which can be pinned on Note7’s Always-On display. S-pen can also be used to create a GIF out of a video. 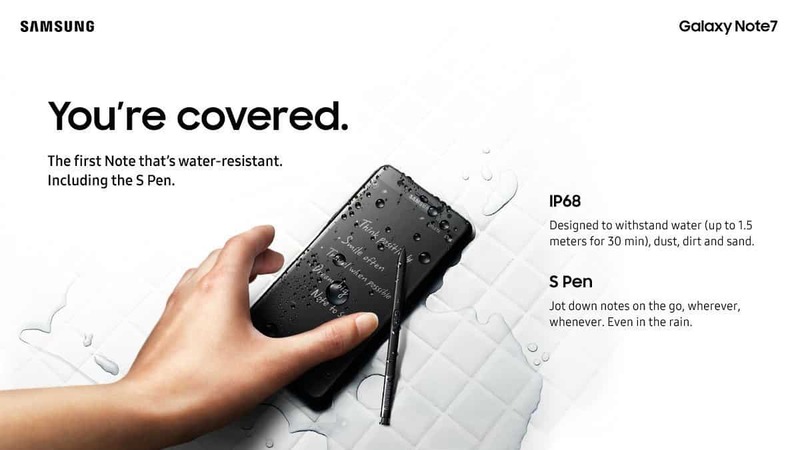 Note 7 and S-Pen is IP-68 water resistant and can survive in 5ft. of water. Samsung Galaxy Note 7 comes with Bio-metric IRIS scanner as security. First premium smartphone with IRIS scanner for enhanced privacy and security. Samsung is tying up with few banks to enhance the usage of IRIS Scanner, enable you do more. 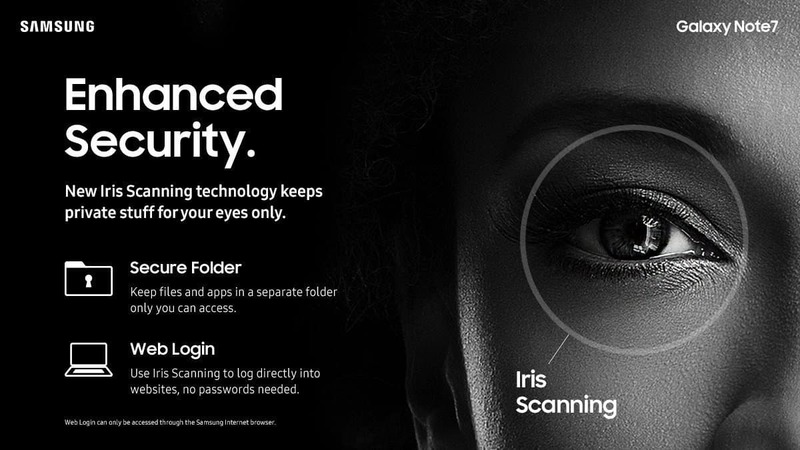 You wont need pattern, passwords, usernames.. Just the IRIS Scanner. Samsung has introduced Secure Folders with an extra layer of protection in which your secured/private files can be kept with ultimate security. You can use IRIS scanner to login to websites. Samsung pay will also be integrated with IRIS Scanner. Samsung Galaxy Note 7 will bring HDR content on any smartphone for the first time. Samsung has also partnered with Amazon to provide HDR content for Galaxy Note 7. The #GalaxyNote7 has the same camera as that of the S7. Low light photography is going to be awesome like S7 and S7 Edge. Features of camera includes 1/2.6″ sensor size, 1.4 µm pixel size, geo-tagging, simultaneous 4K video and 9MP image recording, touch focus, face/smile detection, Auto HDR and Panorama. 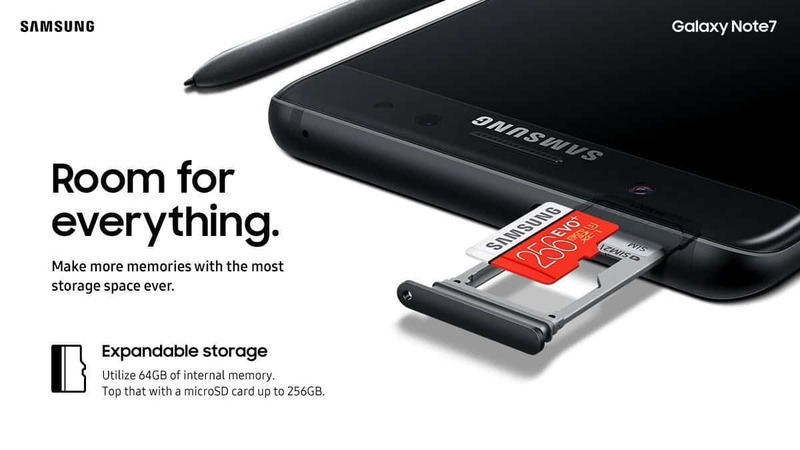 It comes with 64GB internal storage and storage can be expanded upto 256GB with an external microSD card support. Samsung Galaxy Note 7 sports an LPDDR4 4GB ram. 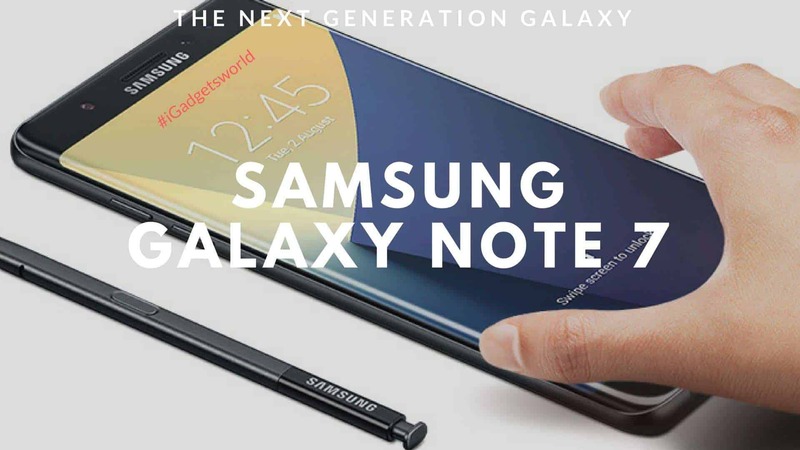 Additionally Samsung Galaxy Note 7 has NFC, USB 3.1 Type-C 1.0, Wi-Fi 802.11 a/b/g/n/ac, dual band and Photo/video editor & Document editor. The #Samsung Galaxy Note 7 will arrive on August 19th. In few days Pre-orders are will begin in most of the countries. The colors will include Blue Coral, Gold Platinum, Silver Titanium and Black Onyx.